Came across this old add recently and somebody may know who the individuals are? Also we would appreciate any information you might have about this Ballinrobe business. 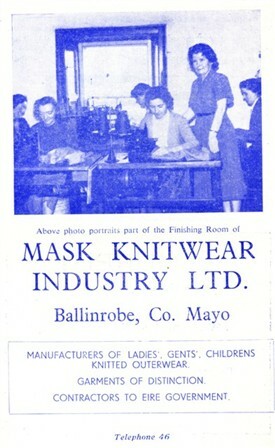 Mask Knitwear operated from the house of my grandfather Michael Garvey on Church Lane. My father (Eddie) often talked about it to us when we were growing up. I figure it was active in the late 1950's early 1960's. As far as I know the business was owned by a number of local people who rented the workspace from my grandfather. The listed phone number, Ballinrobe 46, was our phone number years later growing up in the 1970's.